Dubai, one of the seven Emirate cities of UAE, is truly a wonder city. Being home to the largest building, mall, fountain, man-made island and many such things, it is one of the favourite tourist destinations for several families across the world. The fact that the city of Dubai offers something for people of all ages is also one of the main reasons for this popularity. This city has the ability to surprise you at every turn. So, if you are trying to pick a holiday destination for your family, Dubai is an ideal place. Here are some of the places that you can visit in Dubai with your entire family. Dubai Mall: The Dubai Mall is a Pandora of fun and entertainment. This enormous building is home to a lot of fun related things. On one hand you can catch a movie at the huge multiplex in the mall, while on the other you can also have some fun at the Olympic-size ice rink. One of the most amazing things about this mall is that it has an in-house aquarium and also an underwater zoo. Here, you get to view different types of fishes and a variety of animals found under water. Moreover, this mall also has an incredible indoor theme park called the SEGA Republic. While all these would definitely keep you occupied, one thing that you should not miss in Dubai Mall is the truly astounding light and music show at the fountain. 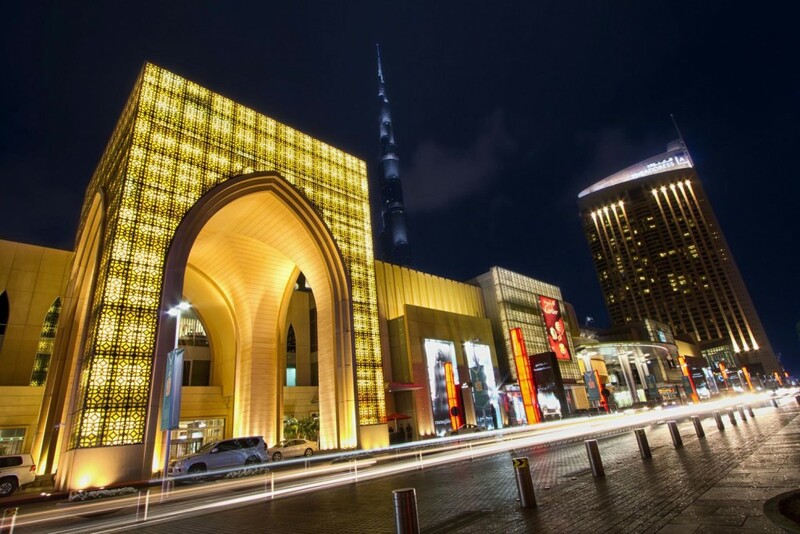 In short, Dubai Mall is not only meant for shopping; there are loads of things that you can enjoy here with your family. 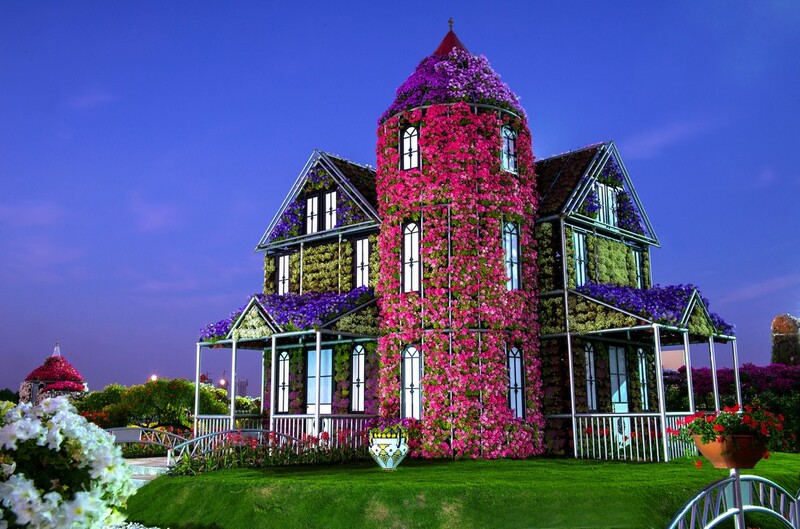 Miracle Garden: Creating a flower garden with over 45 million blooms in a desert land is truly a miracle, and Dubai is the city that has made it a reality. The Miracle Garden is true to its name as it displays 45 million flowers decorated in various beautifully designed shapes. Covering the area of 72000 square metres, the Miracle Garden is where flowerbeds are arranged in different patterns like hearts, stars, igloos and even arches. The best part of this garden is that the flowers as well as their displays are changed every season. This gives a unique look to the garden every time you visit. Some of the highlights of this place include the Butterfly Garden, Edible Garden, Fragrant Village, International Garden, Flower Watch, Children Play Area, Colourful Peacock, etc. This park also has a small space where you can hold birthday parties. As this is a manmade miracle, it is a place which each and every member of your family would fully enjoy. Wild Wadi Water Theme Park: Although the sights of Dubai are amazing, a lot of sightseeing can tire your legs and your mind too. This is especially true in case of children. So, add a fun element to your holiday and visit the Wild Wadi Water Theme park. 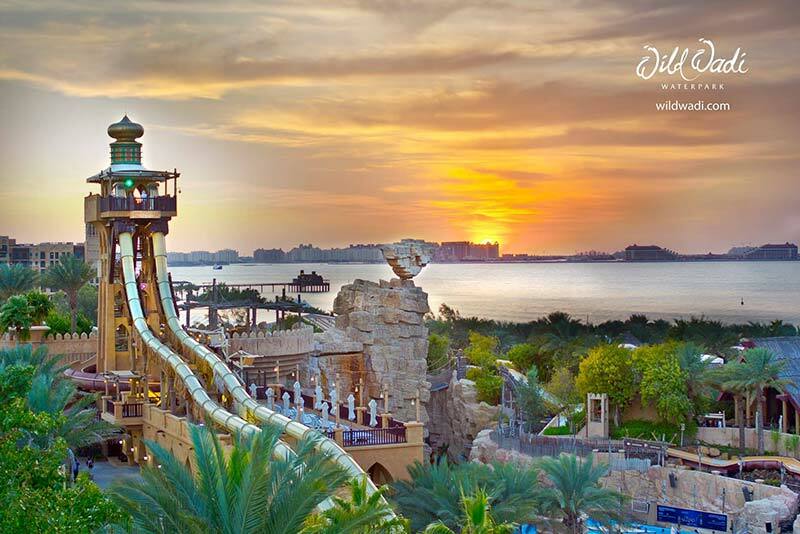 Located between the Jumeirah beach hotel and the Burj Al Arab hotel, the Wild Wadi Water Park is one of the largest parks with 23 thrilling rides. This park has something for children as well as adults. Even if you are not too fond of adventure, this water park is the perfect place to relax and have a great time. This place has so many rides that you can spend an entire day here without repeating rides (although you would want to go on every ride numerous times) and having a lot of fun. 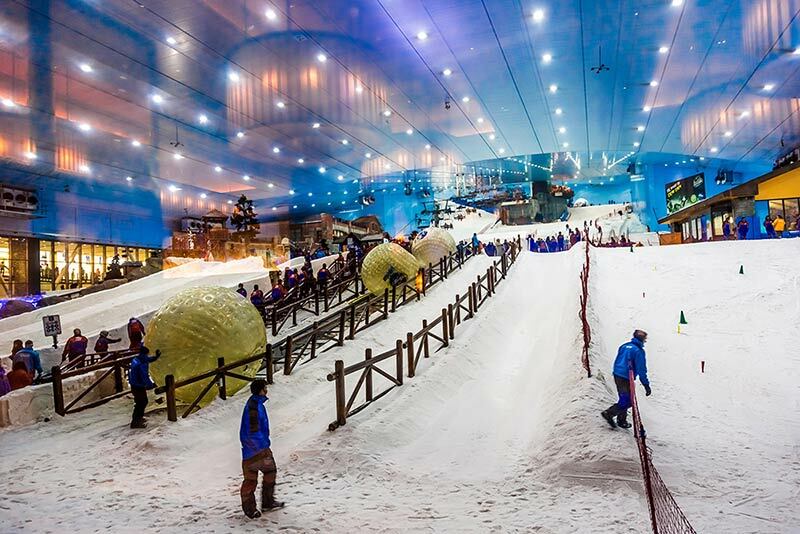 Ski Dubai and Snow Park: Dubai is generally a warm city, with the temperature soaring as high as 40 degrees Celsius. In such a scenario, finding a place to enjoy snow and skiing is something that you would find impossible. But Dubai is an epitome of making the unimaginable a reality! The result of one such heist is the Ski Dubai and Snow Park in the Mall of Emirates, one of the largest malls in the city of Dubai. Ski Dubai is a skiing area that covers the area of three football fields. Here you can ski and snowboard if you are trained in skiing. If you are not interested in skiing, you can enjoy the Snow Park. The Penguin show is one thing that you must not miss. Kids will specially enjoy this. If you want to meet these penguins up close and interact with them, you can go for Penguin Encounter. Wonderland Theme Park: Spending outdoors under the Dubai sun can be a tiring activity. However, you do not like to be holed inside your hotel room when you are on a holiday. Kids specially get bored when they have nothing to do. So, make most of your vacation and visit the Wonderland Theme park. The best thing about this place is that it is an indoor theme park. It also includes a water park with the name Splashland. Kids can enjoy several types of games including a variety of rides, video games, arcade games, skill games, fort games, 3D theatre, action ride theatre, etc. here. Kids would definitely have a lot of fun here. The Dubai Dolphinarium, beach resorts, Global Village, etc. are some of the places that you can visit with your family in Dubai. For a unique experience, take a dinner dhow cruise or visit the stunning heritage sites along the Dubai Creek. Moreover, a must-experience in Dubai is desert safari with exciting inclusions. From overnight safari and desert safari with quad biking to hummer desert safari, you can choose from a plethora of desert safari experiences.